Keep your computer cleaner, and out of the way. 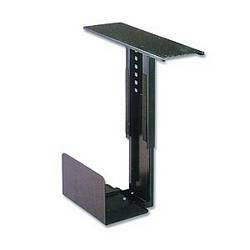 Move your computer to a more convenient location with our CPU holder with under desk mounting kit. Save floor space or desktop space, help keep dust and dirt out of your computer case, and keep your media drives within easy reach. Our CPU holder is constructed of rust-proof powder-coated steel, this stylish bracket adjusts to fit virtually any sized tower case or can be used to conveniently mount a desktop case on its side. Our hanging CPU holders are fully padded with anti-scuff, anti-skid foam to eliminate case damage and prevent the computer from sliding out of the bracket. Adjusts to fit cases from 5 1/4" to 9 1/4" wide and from 15 1/4" to 21" high. Bottom clamp measures to 10 1/2" and top mount clamp measures 13 1/4" x 5 1/2"
Pros: My goals when buying this holder for my home office were (1) make floor cleaning easier by raising my CPU off of the floor, (2) make access to the back of the unit easier without having to crawl under the desk and (3) give my workspace a more professional look. All goals met! Cons: There's a handle on the side of the holder that I rarely use. Now well positioned to be practical. Other Thoughts: I have seen complaints of CPU's pitching. I have had no problem with that. 1342 out of 2541 find this review helpful. They work great. No more employees kicking the pc. Pros: Worked great for holding up PC towers. The only reason why it leans from the previous reviewer is because he installed it wrong. I had a couple leaned the left also but it turned out i had it on backwards. Other Thoughts: Bought over 200 of these brackets to hang up PC towers. Did a wonderful job and they were sent to me with fast shipping. Had all PCs hung up before my deadline was due. 1105 out of 2112 find this review helpful. Pros: I bought two of these Under Desk Mounts and they are supporting a heavy industrial PC and a separate power supply. The holders mounted easilly and I am mostly satisfied with their quality. Cons: The weight limit of 66 pounds is a bit generous. My PC tips the scale at just over 40 pounds and the final mounted position puts enough stress on the mount that the metal flexes. This gives the final suspended position a significant lean to the left. As a staunch conservative, this is unacceptable... I will reverse the hanger so my computer leans to the right. LOL 66 pounds is probably safe to hang, but plan on installing it next to the side of your desk or a wall so that the PC has something to lean against. Other Thoughts: I would like to praise your customer service team. They were very accomodating of my last minute, past cutoff/late afternoon, and panicked order. I really had to have these the next day for an unanticipated business installation. Thank you for your pleasant, professional and patient assistance! 964 out of 1904 find this review helpful.